First he was indicted by the special counsel's office — then he was tattooed by the Richard Nixon Foundation. The Nixon Foundation took to Twitter on Friday to distance the disgraced former president from indicted Nixon superfan Roger Stone. 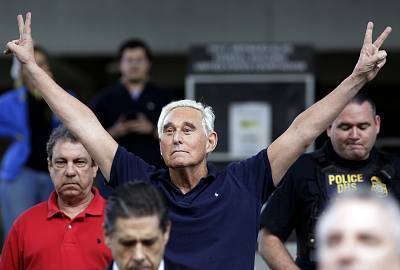 As Stone, 66, left court after getting hit by charges from special counsel Robert Mueller, he flashed a Nixon-style double-V for victory to cheers from supporters. Stone started his political career working for Nixon's re-election campaign and calls Nixon one of his political heroes — he even has a tattoo of the 37th president's face on his back. The Nixon Foundation — which helps run his presidential library in Yorba Linda, Calif. — apparently didn't appreciate coverage of the event referring to Stone as a former Nixon aide. "This morning's widely-circulated characterization of Roger Stone as a Nixon campaign aide or adviser is a gross misstatement. Mr. Stone was 16 years old during the Nixon presidential campaign of 1968 and 20 years old during the reelection campaign of 1972," the foundation tweeted, saying he was a mere "junior scheduler on the Nixon reelection committee. Mr. Stone was not a campaign aide or adviser." Stone has insisted he was more than a scheduler — he's maintained that his real job was dispatching people to spy on the campaign of Democratic nominee Hubert Humphrey. 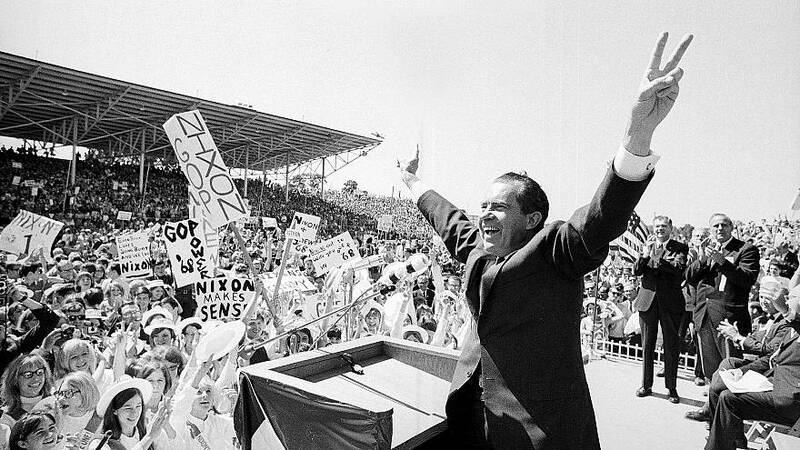 Nixon resigned in 1974 before he could be impeached because of the Watergate scandal. He died in 1994.